Learn about the different ingredients and recipes players can craft within Pokemon Quest. The newest free-to-start Pokemon experience has arrived in the form of Pokemon Quest, a vibrant touch-based title that sees players recruiting and battling pocket monsters across Tumblecube Island. Aside from heading out on expeditions and fighting in real-time battles, players will also be able to collect and cook different ingredients and recipes. Cooking recipes is one of the primary ways that players can attract new pocket monsters to their home camp. Not only is it fun to watch as different foods draw in different creatures, recipes also provide an opportunity for players to add different Pokemon to their party and eventually fill out their Pokedex. Be sure to check out the Shacknews guide on how to get more cooking pots, an important feature if players want to cook more efficiently. Edit: this guide was updated on June 29 to give more information about pot upgrades and an example recipe for the Ambrosia of Legends. The overall procedure for cooking in Pokemon Quest couldn't be any more simple. To cook a recipe, just head over to the home camp, then select or tap on the cooking pot. Doing so will bring up a menu that allows players to place up to five different ingredients in the pot and review some of the recipes they've created so far. Once the pot has been filled, select or tap on the Start Cooking button to complete the recipe. It'll take some time for the dish to finish preparation, so players will likely want to head back out into the field for more battling, though they can choose to spend some of their PM Tickets to speed up the process if they so choose. Do note that players can eventually unlock new pots: where the Default Pot requires at least three ingredients, the upgraded Bronze Pot requires ten, the Silver Pot will require 15, and the ultimate Gold Pot requires 20 ingredients. 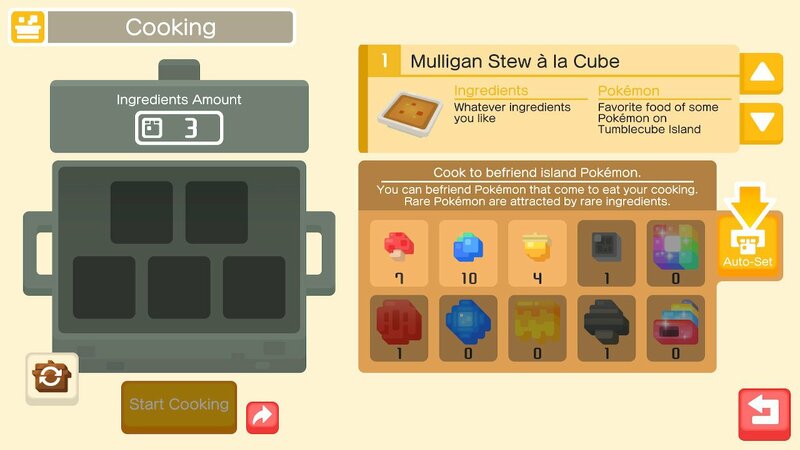 There are 18 different recipes that players can cook in Pokemon Quest, with each one providing something vague directions for which ingredients go into it. Players confused about what certain recipes require should check the ingredients list above — listings like "a whole lot of sweet things and a few mushrooms" for the Get Swole Syrup a la Cube are likely referencing sweet ingredients like Bluk Berries as well as mushrooms like the Tiny or Balm variants. Players can experiment with different combinations of ingredients, but they'll need to use at least five different ingredients for each recipe. Props to redditor user andrewmaxedon over on the Pokemon subreddit for listing some successful recipe ingredient combinations. Here's the list of all 18 recipes we've found in Pokemon Quest, plus descriptions pulled from the game and example recipe combinations. That's it for the ingredients and recipes we've found in Pokemon Quest so far. Be sure to check back with us as we update this guide with new information as it becomes available. 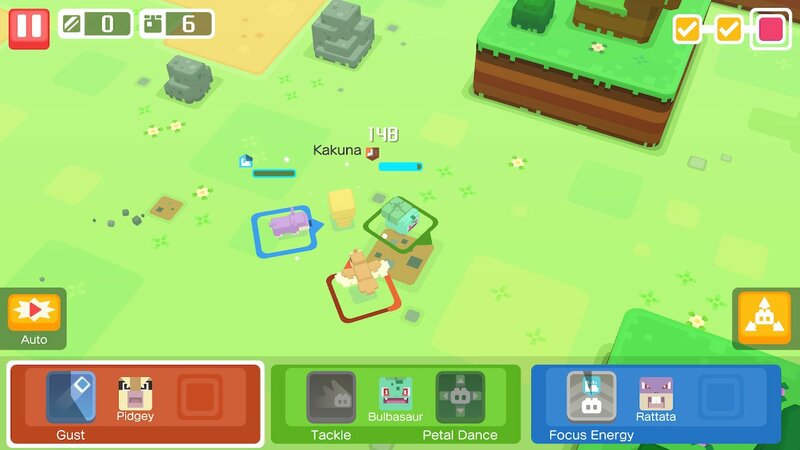 Players looking to learn more about the latest Pokemon game can check out our guides detailing what Pokemon Quest is all about, how to download the game on Nintendo Switch, and when Pokemon Quest is expected to release on iOS and Android devices. For more excellent guides and news covering all facets of the gaming community, keep it tuned right here to Shacknews.